Jesus didn't come to bring reconciliation and peace between men, he came to reconcile man and God. He came to bring us back into relationship with God, as we were created to be, as it was in the beginning. The problem is not that God allows war, the problem is that not everyone accepts the relationship that God offers them, even those committed to religion do not embrace the relationship God desires and created them for. The problem is not God, the problem is the lack of relationship with God. It is because of this lack of relationship that Jesus talks in chapter 10 about persecution. He wants to protect you as his follower and keep you safe and he wants you to be aware of what difficulties you will face. Throughout chapter 10 he talks about the places we will go, the reception we may receive and the persecution. He cares about what happens to you. You may think that you must always stand firm and even in rejection of your faith keep going. This is not so, Jesus says that if you are not welcomed then you should shake the dust from your feet and move on. If there is danger in one place leave and go to another. Jesus knows that his name will bring persecution to those who declare it but he does not want you to suffer if it can be avoided. Jesus reassures, as a friend would if you were stepping into an uncertain situation. In the space of six verses, 10:26-31 he says "do not be afraid" four times. You are not part of some detached religion where you follow rules, you are acknowledged by God as a person, an individual and a valuable one at that. The difference between believers in God and followers of Jesus is in the relationship, Jesus reveals the person of God. Read again, chapter 11: 25-30, God can only be known by Jesus and Jesus makes God known to those he chooses, and you have been chosen. Coming to Jesus and into relationship with him affords a peace and rest that cannot be found anywhere else. Religious rest is found in good works and religious rituals but this gives no rest to the spirit and soul. Jesus takes your sin and your burdens and offers true peace and spiritual rest. 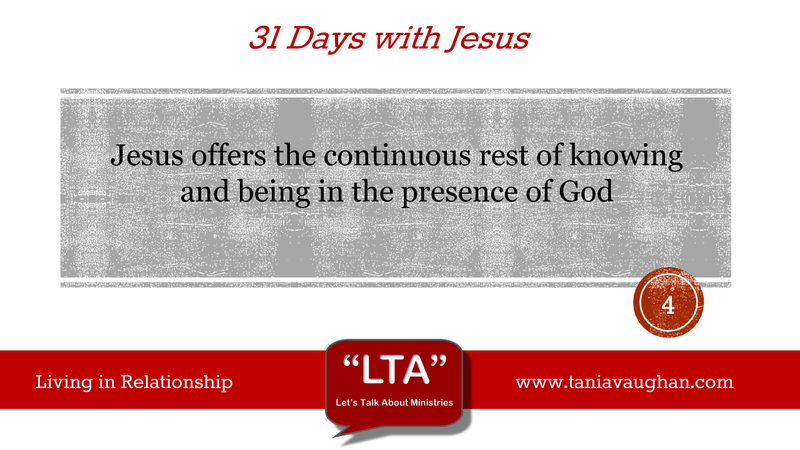 It is a continuous rest found in knowing and being in the presence of God. We can get a glimpse of this kind of rest when we spend the day with a friend or a loved one, so in tune with each other that you feel rested and at peace deep within you, you have an inner smile. It is that relationship that Jesus offers as he brings us into the presence of God, but unlike those one off days, this peace is always available. This does not mean that you will have a peaceful life it means you can live in chaos and still know peace in your heart. There are Christians around the world who live in a state of chaos and persecution and yet they keep going because they know the peace of knowing Christ in a relationship. Are you able to declare God's goodness is all circumstances? Do you defend your religion or a friend? Do you need to put more time into your relationship rather than your religion? Lord, I thank you that you have chosen me to come into your presence through Jesus. I want to get to know you more Lord, so that when I am persecuted or questioned, I can defend a loving and giving person rather than a detached religion. Help me to know when to walk away from those who are against you and keep me safe. Bring me into your presence so that I can know your peace in the midst of chaos. JC is very clear - He's not come to smooth waters or sign treaties. He's come to reconcile man with a creator God. God created us with free will and we have exercised that by embracing sin within a fallen world. God sent his Son to die a blameless sacrifice for our sin, You hilghlight well that JC is about relationship as it is through relationship and understanding what this means that we can grow and grow closer to God. I also like the passage where JC is accused of being the Prince of Demons - As if Light and Dark can co-exist. Funny how society always seems to beat the good guy down!